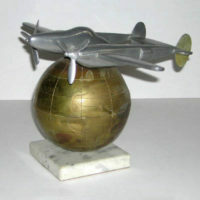 A silver-plated trophy and accompanying photograph commemorating the first transcontinental “Air Excursion” by Transcontinental and Western Air (TWA) on November 19, 1935. Also included is a 1931 map of TWA’s transcontinental route. All the items relate to TWA’s “Lindbergh Line,” essentially a promotional name for their transcontinental routes. The tapering cylindrical trophy supports three standing eagles with large upraised wings holding a terrestrial globe topped with a twin-propeller airplane. 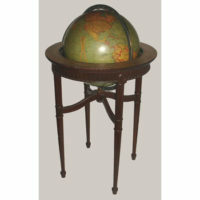 The 4-inch terrestrial globe has engraved and hatch-mark shaded continents. The cylindrical body of the trophy is decorated with neoclassical festoons and ornaments framing an inscription, above a raised wreath base. It stands on a round tapering black bakelite base having a series of inscribed sterling silver shields listing the names and home towns of the passengers, all of whom were from suburbs of Philadelphia. The trophy is accompanied by a photograph of members of the excursion posed in front of the airplane. These items come from the estate of Morris Kipp, the businessman who sponsored the event and recruited the participants. Transcontinental and Western Air (TWA) formed in 1930 as a merger between Western Air Express, an airline founded in 1925, and Transcontinental Air Transport, the first airline to offer coast-to-coast service, a combination of air and rail, in 1929. The latter was nicknamed the “Lindbergh Line” after Charles Lindbergh, who had become the company’s technical advisor following his famous trans-Atlantic solo flight in 1927. After the merger, TWA continued to use the slogan and featured its connection with Lindbergh prominently in promotional materials. In October 1930, TWA was the first airline to offer all-air coast-to-coast service, with an overnight stop in Kansas City. By 1937, TWA passengers could travel from Los Angeles to New York in 16 hours. In 1950 the corporate name was changed to Trans World Airlines, keeping the acronym TWA. Series of shield-shaped plaques, each inscribed with the name and address of one or two of 13 passengers: Miss M. Estelle Levering, Jenkintown, PA; Mr. and Mrs. August L. Martin, Lansdale, PA.; Mr. and Mrs. Charles R. Ridington, Lansdale, PA.; Mr. And Mrs. Richard M.W. Ridington, Lansdale PA.; Mr. Elmer G. Kulp, Lansdale PA.; Mr. and Mrs. Arthur H. Becker, Kulpesville, PA.; Mr. Joseph Kline, Lansdale PA.; Miss Leona Becker, Kulpesville, PA.; Mr. George W. Knipe, Lansdale, PA. Description affixed to photograph: First Transcontinental Air Excursion of America/ Sponsor and Organizer—Morris…Kipp… / November 19, 1935. L to R 1st row: TWA Agent, Mrs. R.W. Ridington, Miss Leona Becker, Miss M. Estelle Levering, Mr. Elmer G. Kulp, Mrs. C.R. Ridington, Mr. C.H. Ridington, Mr. R.W. Ridington, Mr. George W. Knipe, Editor, Mr. Arthur Becker, Mrs. Arthur, Mrs. August Martin, Mr. August Martin, Mr. Jos. Kline, 2d Row: L to R. Mr. J.W. Clemsen TWA MGR., PILOT TWA. 3d Row L to R. Morris Kipp Sponsor, TWA Pilot. Map cartouche: Transcontinental & Western Air, Inc./ The Lindbergh Line — Standard Air Line of the World. Condition: Trophy very good, with only minor wear, having been professionally re-plated. Photograph very good with the usual overall toning, matted in original frame. Map, folds as issued; very good with the usual overall light toning, wear, soft creases. Catalog of Copyright Entries. Part 1. Books, Group 2. New Series, Vol. 28, Part 2. Last Half of 1931. Nos. 8-12. Washington, D.C.: United States Government Printing Office, 1932. p. 1666. Online at Google Books. http://books.google.com/books?id=Z1tbAAAAIAAJ (25 March 2010). “Transport: TWA Trippers.” Time Magazine. 15 November 1937. Online at Time. 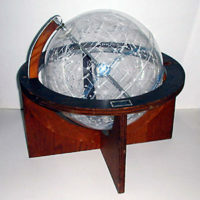 http://www.time.com/time/magazine/article/0,9171,758334,00.html (25 March 2010).